After the fire in 1866 there was doubt for a while as to whether or not the University would continue to operate. Between the aftermath of the war, the fire, and the general uncertainty regarding the University’s future, enrollment at Norwich dropped dramatically. Norwich opened its doors that fall with only 19 students. 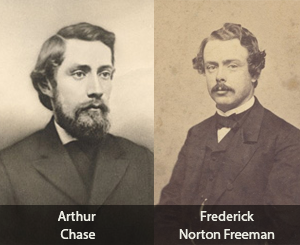 Despite the low enrollment numbers, however, Theta Chi and another fraternity, Alpha Sigma Pi, flourished.In 1881, the student body of Norwich comprised 12 students, and Theta Chi found itself with only one active member, James M. Holland. Holland, with the help of local alumni, managed to keep the Fraternity afloat by recruiting two new initiates, Phil S. Randall and Henry B. Hersey. Holland is generally credited with saving Theta Chi from an otherwise likely extinction. If our Founders could see us today, they would surely be proud of what they saw. Over 160,000 men have been initiated into the Fraternity since its founding. On April 9, 2011, Theta Chi installed its 220th chapter, Iota Xi at Georgia College and State University, and began the second half of the Iota series of chapters.